Thinking About Buying a Silhouette? 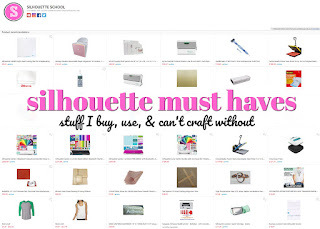 Are you thinking about buying a Silhouette cutting machine? 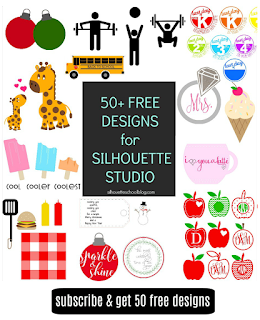 If you’ve been a crafter for any period of time you’ve probably come across a pin here or a blog post there that refers to a Silhouette. 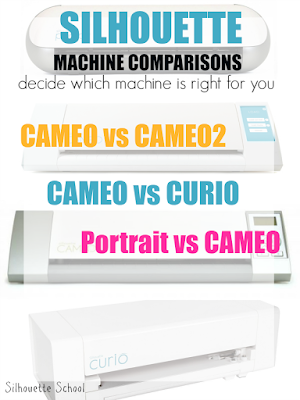 There are currently six Silhouette America machines on the market: the original SD , the 12” die cutter the CAMEO, the CAMEO 2 (released in October 2013 with a touch screen), and the 8” cutter, the Portrait. In the second half of 2015 Silhouette America also released the Silhouette Curio and the Silhouette Mint. The Curio is a specialty type machine that can cut, emboss, stipple etch and deep cut. The Mint is a stamping making machine that requires it's own software, different from Silhouette Studio which the other five machines use. More on which machine is right for you and a side by side comparison can be found further down the page. With the exception of the Mint, all of the machines are capable of cutting not only paper, but a wide variety of materials including vinyl, heat transfer vinyl, card stock, stencil material, contact paper, freezer paper, chipboard, adhesive-backed paper, fabric and more. The possibilities to create are only limited by your imagination and creativity. Both the CAMEO, Portrait and Curio can cut all of the same materials as well as sketch, engrave, emboss (limited on CAMEO and Portrait), create rhinestone templates, cut stamping material, and print and cut. In addition, the cutting blade can also be replaced by a pen, pencil, marker, or chalk marker to create sketched designs. There are also engravers on the market, most popular is the Amy Chomas Engraving Tip, that can be purchased to use with the Silhouette cutting machines. With the CAMEO and Portrait, a stylus is needed to emboss, although capabilities are limited due to the amount of pressure the motor on the machine can produce. 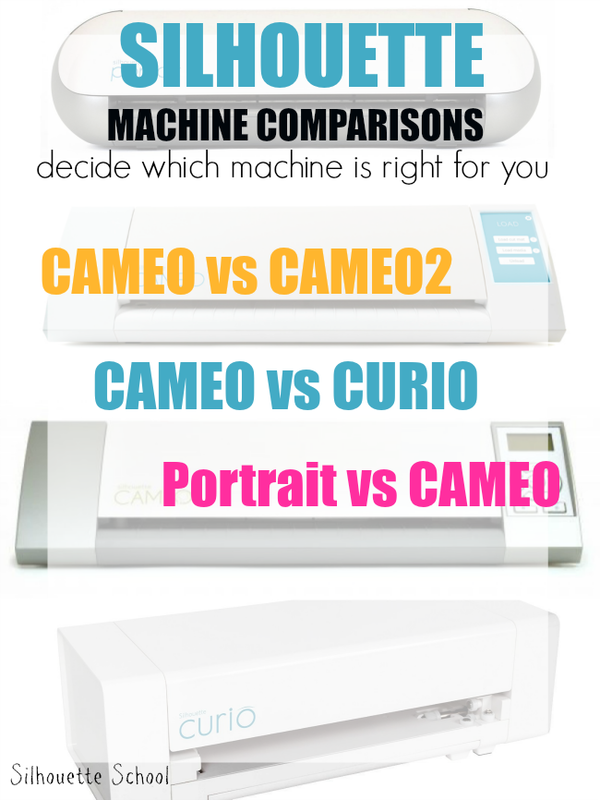 Which machine is right for you will depend on a few factors. The two big differences between the CAMEO and the Portrait are the price tag and the cutting size capability. The Portrait is significantly less in size and price. However, if you can find a CAMEO Bundle on sale for under $230, the extra expense is well worth it for the larger size machine. While the Portrait is smaller and less expensive, it is often difficult to find rolls of vinyl that can be fed into it without having to be cut down first. Cutting three inches off a 10 foot roll of vinyl is not easy to do in a straight line. When the vinyl edge is not straight, there is a risk that it will not stay under the rollers and when it fails to stay under the rollers, the material slips and the cut malfunctions. There is a high risk of wasting a lot of material this way. That being said, 9” rolls of vinyl are available, though more limited. The Silhouette Roll Feeder is one great solution to preventing vinyl from slipping. In addition, if you’re a scrapbooker, scrapbook paper is 12x12 “standard. The 12” CAMEO is perfect for creating 12” scrapbook page layouts. With the CAMEO you have the ability to move the rollers in to account for smaller width materials. The rollers on the Portrait cannot be adjusted. The CAMEO also has a digital control panel while the Portrait has several different buttons, rather than a digital screen to unload and load the mat and materials. The Portrait is also smaller and lighter weight. It takes up less desk space and can be transported more easily, however, the size and weight differences should not be considered significant enough to really make a huge impact on a purchase decision. Within the software, called Silhouette Studio, the Portrait and CAMEO have all the same capabilities. There are options you’ll need to select on the Page Settings window (l) to pick which size mat (CAMEO or Portrait) you are cutting on, but the software will automatically detect which machine you have plugged in and will default to that page layout. My original machine was the Silhouette Portrait, the smaller of the two cutting machines. When I put the Portrait on my Christmas wish list in 2013 I was more of a DIYer than a crafter. I knew a Silhouette would take my DIY spirit and crafting to a whole new level, but I just wasn’t sure if I thought the higher price tag was worth it. For a year I used my Portrait rarely feeling limited by the smaller size. However, a good deal ($199) on the CAMEO starter bundle pushed me to purchase the CAMEO so I now use both machines, although admittedly I use the CAMEO more. 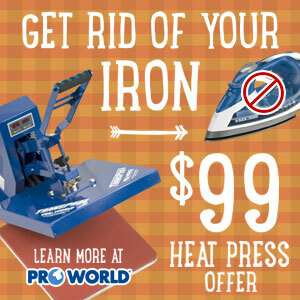 Once you’ve decided which size machine is best for you, consider purchasing your machine with a bundle. There are a wide variety of bundles available - I have listed some of the most popular CAMEO bundles below. Instead of only getting the machine, software, and 50 designs in your library to start, bundles offer more. Pick a bundle based on the main reason you are purchasing the die cut machine. 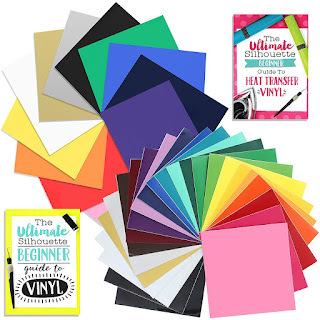 If you are most interested in making vinyl decals, get the vinyl bundle that comes with some necessary tools and vinyl to get started. If you’re interested in cutting fabric to make appliqués, purchase the cutting bundle that comes with the fabric blade and related items to get you started cutting fabric. If you’re just not sure which bundle is best for you because you want to do it all, go for the CAMEO Starter Bundle that comes with an extra mat, tools, and blades. You will always need these items when using your Silhouette machine. Amazon recently added a new option: Silhouette CAMEO Build Your Own Bundle which allows you to pick and choose what tools, accessories and materials you'd like to purchase with your CAMEO. This first $30 worth of extras in the bundle are free after the CAMEO. 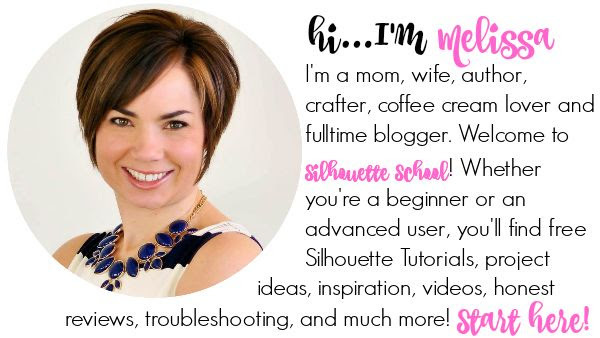 Once you've decided on the right machine for you, you're probably wondering what Silhouette accessories and tools are necessary to get started...you can find the answer and a shopping list here! The differences between the Portrait/CAMEO and Curio are greater. Unlike the CAMEO and Portrait which can being an 'either/or' choice, the Curio, released in August 2015, should be considered an accessory or add-on item. It specializes in cutting, etching, embossing, and stippling thicker materials in a significantly smaller area. The Silhouette Curio has a larger clearance which means it can cut 5x thicker materials, however the cutting area is smaller. The max cut size area on the Silhouette Curio is 8.5x12 (it comes with 8.5x6 cutting and embossing mats). 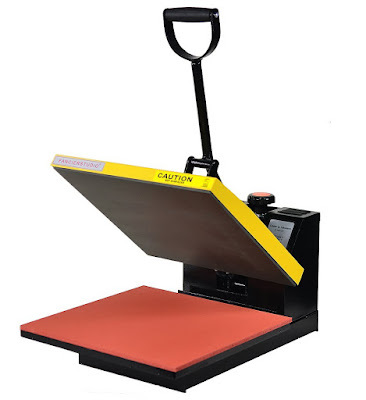 The Silhouette Cameo has a lower clearance (1mm), but can cut 12x12 on the standard cutting mat or 12" by 10 feet without the mat or with the Silhouette Roll Feeder. The Silhouette Portrait can cut up to 8.5" across by 10' long. The Silhouette Curio's dual housing can handle two cutting/embossing tools at one time whereas the Silhouette Cameo and Portrait can only hold one tool at a time. The Silhouette Curio comes with several mats and platforms. The user needs to build platforms based on the thickness of the material being cut or embossed. The mats are then snapped into a large tray-like base that is loaded into the Silhouette Curio. The Silhouette Cameo and Silhouette Portrait each use a sticky cutting mat with no platforms or base necessary. The Silhouette Curio embossing mat does not have grid lines on it, while the Curio cutting mat and the CAMEO and Portrait mats do. All of the blades and tips that fit in the Silhouette CURIO can also fit in the blade housing in both the Silhouette CAMEO or Portrait. All blades are also available (or will be available) to be purchased separately from the machines. Also, there is built in blade ratchet on the Silhouette Curio, but it's on the platform and not the base of the actual machine like on the Cameo and Portrait. The Silhouette CAMEO and Portrait can cut a wide variety of materials including vinyl, htv, paper, cardstock, foil papers, magnet material, rhinestone template, stencil material, contact paper...the list goes on and on and on. The Silhouette CURIO can cut the same materials - but on a MUCH, much smaller scale. See 'Cutting Areas' above. The Curio is meant, however, more as a specialty tool for embossing and stippling metal sheets, paper, and foil as well as deep cutting. Scoring and embossing and etching on foiled cardstock worked similarly on both machines. It's tough to photograph this paper, but I was pleased with the results. Scoring and embossing on CAMEO using the Curio embossing mat and fine embossing tip was almost non existent on white cardstock - so much so that I could not even get the score or emboss lines to show up in a picture. The Curio results, below, were better (score on blade 0, emboss 2 passes)...relatively. The Silhouette Curio gives additional editing and design tools and options in Silhouette Studio. Unlike the Silhouette CAMEO and Portraits, the Curio's USB must be connected to the computer where Silhouette Studio is being used to access the embossing and stippling tools - or it has to have been the last machine plugged into the computer. The Silhouette Curio cut settings windows include two panels for tools - a red and blue - since the carriage can hold two tools at a time for a single pass. The Silhouette Curio embossing auto-mirror function does not give you a preview in the software of where the mirrored design is placed. In addition, with Curio the software mirrors the entire page as compared to the mirror functions in CAMEO and Portrait which mirror directly right or left. Admittedly some differences between the two machines are more significant than others. If you're interested to know my honest, no sugar-coated opinion on the Silhouette Curio rather than just a side by side comparison of the stats - head over here to see my first impressions of how the Curio cuts/embosses. Worrying About Learning to Use Silhouette? Don't! I'm biased, but I'm not the only one who agrees (read the reviews! 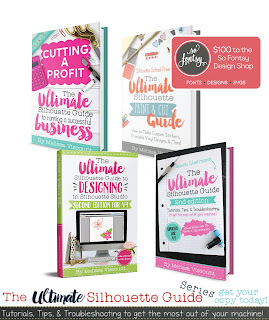 ), my book The Ultimate Silhouette Guide is the only tool you'll need to learn your machine inside and out! The Ultimate Silhouette Guide makes tool, material, and accessory suggestions based on what types of projects you are working on. With my full book The Ultimate Silhouette Guide you'll learn the functions and names of every icon in Silhouette Studio software and how to use them, the glossary will help you grasp the Sil lingo, you'll learn how to manipulate tools to work together to create your own design, you'll have step by step directions on cutting a wide range of material at your fingertips, and the extensive troubleshooting section will get you out of any jam when you're stuck. Everything you need to know to get the most out of your machine is in my 140 page reference book - The Ultimate Silhouette Guide - is available as an instant ebook download or paper back. 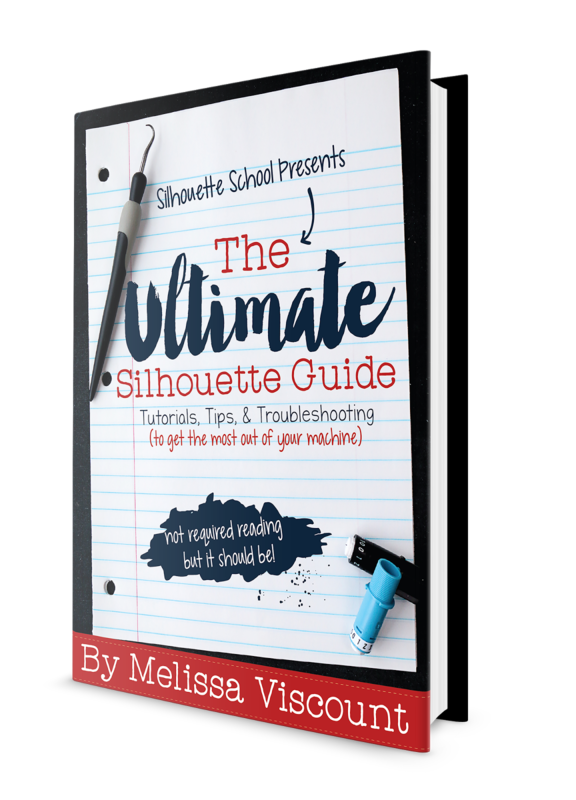 Check out the full Silhouette School ebook site to read reviews, learn more, take a peek inside the pages, and order!